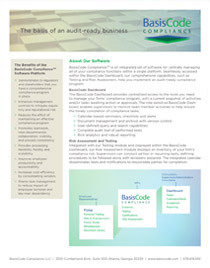 The BasisCode Compliance™ software automates and streamlines processing within a single compliance technology platform. Instead of relying on labor-intensive and error-prone manual methodologies, you can allocate staff to tasks that require personal attention, and free them to focus on more profit-driving functions. The browser-based interface allows users to view and respond to cases online, generate alerts and route them to designated officers, facilitating teamwork and faster collaboration. Integrated with our compliance Risk Assessment module and displayed within the BasisCode Dashboard, our compliance Testing module enables officers to create and conduct ad hoc or recurring tests, defining procedures to be followed along with reviewers assigned. The integrated calendar disseminates tests and notifications to responsible parties for completion. Report on historical metrics, such as the number or percentage of exceptions for a given date range by test, to: 1) identify the effectiveness of testing; 2) monitor the timeliness of resolution; 3) evaluate staff performance; and 4) confirm initial risk assessment assumptions. 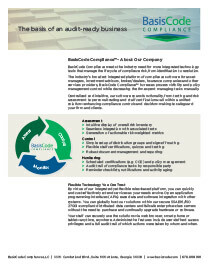 Test and review findings, exceptions, comments, documents, and signoffs, which are time-stamped and centrally archived. 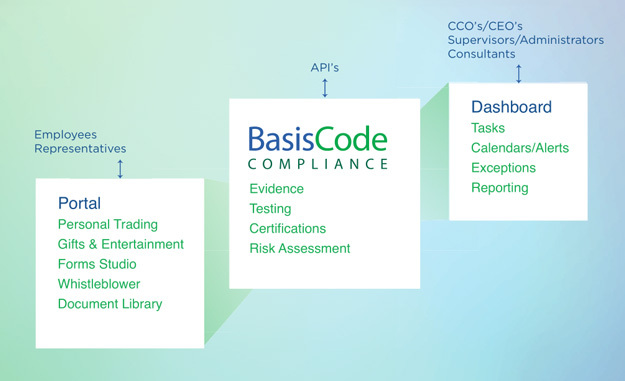 Seamlessly accessed from the BasisCode Dashboard, our compliance Risk Assessment module displays an inventory of your firm’s compliance risk. Provides the ability to rank and weight risk factors, archive past assessments and link to the controls (testing, certifications, etc.) that are mitigating identified risks, demonstrating an audit-ready business to regulators, senior management, and your Board. 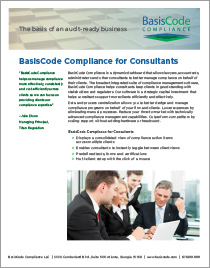 BasisCode Compliance centrally manages evidence that you are maintaining a sound compliance program on behalf of your firm and clients, as well as regulators and auditors. Evidence such as policies, surveys, certifications and documentation can be directly linked to specific instances of tasks and controls alongside the case findings, impact and resolution. Our compliance management tools maintain user and time stamps when staff contribute or add evidence to cases demonstrating a culture of compliance. Combined, these capabilities provide proof of compliance, viewable within centralized dashboards, and deliverable in multiple report formats for internal and external auditors and regulators.